Over a year after its US debut, Naoko Yamada’s moving A Silent Voice will return to US theaters in a special two-night event this January. ELEVEN ARTS and Fathom Events are bringing A Silent Voice back to US theaters for two nights only – Monday, January 28 (subtitled), and Thursday, January 31 (English dubbed). The film, based on Yoshitoki Oima’s manga of the same name, focuses on the struggles of adolescence and the consequences of bullying. It centers around Shoko Nishimiya, a deaf girl, and her bullying at the hands of Shoya Ishida. When Nishimiya eventually transfers, Ishida is blamed, and he quickly goes from bully to bullied. Ostracized by the people he once called friends, he grows up depressed and alone, and later ends up seeking out Nishimiya in order to make amends. In addition to the full feature film, audiences will be treated to a short feature and interview with Lexi Cowden, the dub voice actress for Nishimiya. Cowden talks about her experiences in a deaf community group and how it relates to the film. The English dub cast includes Robbie Daymond as Shoya Ishida, Ryan Shanahan as Shoya (older), Kira Buckland as Naoka Ueno, Gia Grace as Naoka (older), Amber Lee Conners as Miki Kawai, Annabelle Corigliano as Miki (older), Melissa Hope as Miyoko Sahara, Catie Harvery as Miyoko (older), Michael Sinterniklaas as Kazuki Shimada, Spencer Rosen as Kazuki (older), Kristen Sullivan as Yuzuru Nishimiya, Lipica Shah as Yaeko Nishimiya, Janis Carol as Ito Nishimiya, Sara Cravens as Miyoko Ishida, and Graham Halstead as Nagatsuka. I reviewed the film when it first debuted in the US, and I found it to be an emotional gut-punch with beautiful animation and a masterful use of music. 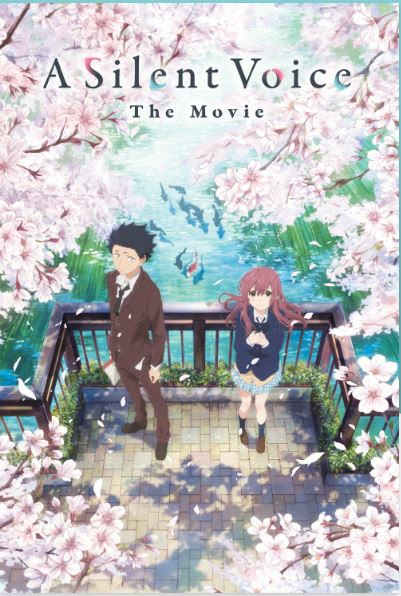 A Silent Voice will be screened in more than 500 theaters across the US. To find a theater near you, visit the Fathom Events event page. Previous:Hasbro “Captain Marvel” Movie Action Dolls – Review: One of Them Comes with Goose the Cat!